The earth would experience a unique curse of mutation and death that it did not before know. Mutation of formerly beneficial plants arose to produce a malicious growth of thorn that would only bring sorrow and pain to man, who would be forced to contend with its pernicious and prolific growth while he attempted to grow edible plants from the earth. 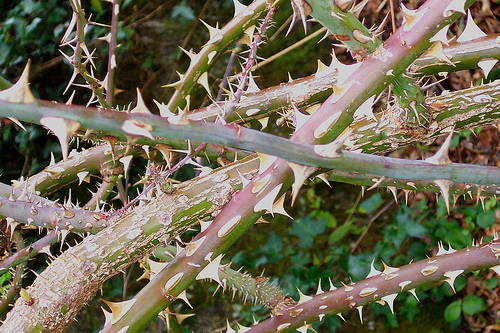 The presence of thorns upon the ground displayed the fact that mankind no longer had dominion over the earth. Rather, the earth was exerting enmity towards its former guardian. The world was no longer under his control. 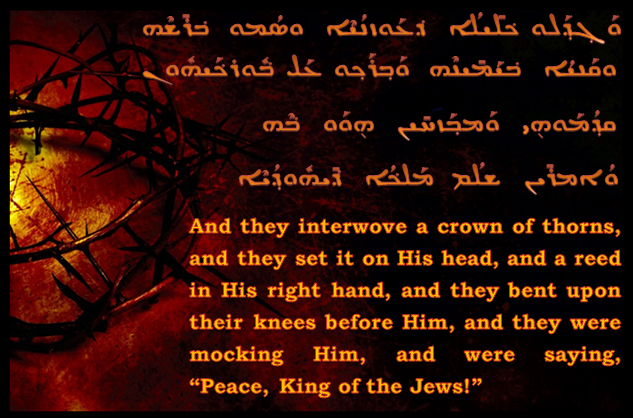 The Messiah wearing a crown of thorns has been commented on by many wise and perceptive readers of Scripture in connection to the curse of the ground. With His bearing the thorny crown, He was showcasing that the earth itself was to be redeemed from the curse Adam brought upon it in his disobedience. The harsh reality of sin was held up and displayed for all to see: this is the cursed-earth crown with which fallen man crowned the only unfallen Man ever to walk this earth. It is ironic, and yet the importance of it cannot be overlooked. ​This verse is linked to the third and final reference to the crown of thorns, found in John 19:5. In both of these passages, the word translated as “briars” is notably different than the term used in Matthew for “thorns.” I have translated the term in Mark and John with a slightly different word to convey the subtle difference in meaning. There is no different term used between these texts in their Greek parallels (it is STEPHANOS in all three accounts between the various Greek texts), which shows that the Aramaic Peshitta text has preserved an original detail very much worthy of our attention. This detail provides us with the alternative concept of a crown of “sorrows” being placed upon the head of the Messiah! It is entirely appropriate to look at in that way, for it shows us the result of our sins, of the curse upon the earth, is truly that of sorrow. Upon His head, Messiah bore a crown representing sorrow for all that man has done to this world and the ways of the Holy One. The crown of thorns is a crown of sorrows in every way! The reader may also be thinking of the prophecy about the Messiah’s suffering that is recorded for us in the book of Isaiah chapter 53. In that wrenching account of what Messiah would go through to redeem men, it links Him twice to sorrows. In 53:3, He is called ISH MAK’OVOTH (a Man of sorrows), and in 53:4, He is said to have MAK’OVEYNU S’VALAM (bore our sorrows). He truly bore the burden of sorrow upon His head with the crown of thorns. 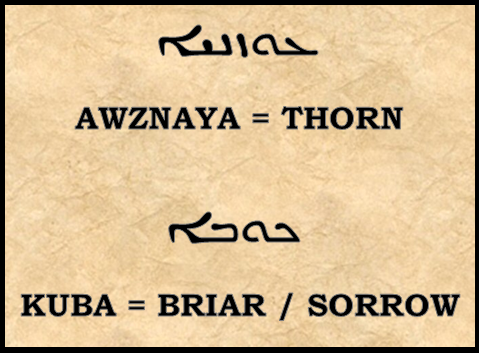 Amazingly, the word used in both of these verses for “sorrows” is the exact same cognate root from whence the Aramaic term for “sorrow / briar” comes! The word in Hebrew arises from the root K’AV, meaning just “sorrow.” While it does not specifically mean “thorn / briar” in the Hebrew language, it did come to take on that additional meaning in the Aramaic language, and the fact that such a root is present in Isaiah 53:3-4 is important to consider. 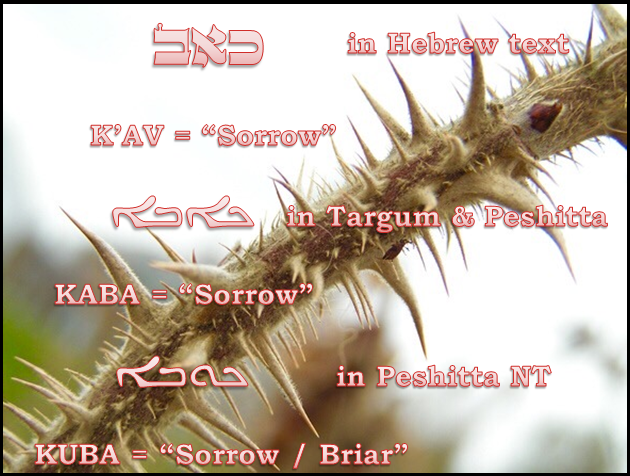 Even the Aramaic text translated from the Hebrew of Isaiah 53:3 – both the Targum Yonatan and the Peshitta, use the same Aramaic concept of “sorrows / briars.” This statement in the book of the prophet Isaiah was a powerful hint of what was to come – of how our sorrows would be borne by the Messiah! 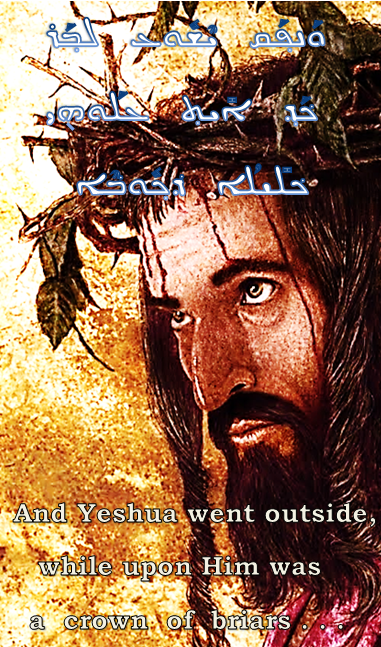 When these realities are brought forth, it becomes very clear why Messiah wore upon His head that crown of thorns. It was a wordless referral to the curse handed out in the Garden, but also, more specifically, was directly hinted at in the Hebrew text and Aramaic translation of Isaiah 53:3-4! The crown of thorns was thus not a cruel mockery imagined first in the minds of the heartless soldiers on that dark day, but was a prophetically-planned event to show us that all our sorrows were borne by our King with a crown no other king would ever dare allow to be placed upon their head. Only the true King of Kings could willingly wear such a crown of sorrows! He is worthy of all praise for His obedience to the Father and His dedication to our deliverance!